~ 6.0 inches, 92.9 cm2 (~76.8% screen-to-body ratio). ~ AMOLED capacitive touchscreen, 16M colors. ~ 8 GB, 128/512 GB RAM. ~ 12 MP, LED flash, HDR, panorama. ~ Non-removable Li-Ion 4000 mAh battery. 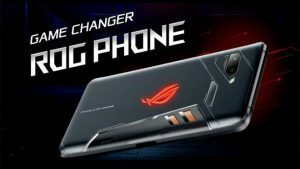 ASUS introduce in 1st time in their smartphone series ASUS ROG phone. Especially its made for the gamers. Cause gamers always want more in their smartphone. ASUS ROG Phone is an Android gaming smartphone and this device was announced on 8 June 2018. Its compete with Razer Phone and Xiaomi Black Shark.